A combination of “funny” and “tragic” has never been very easy to strike in a film, usually leading to fans of one side disappointed. One could argue that a documentary has the greatest ability to strike this balance. After all, the best example of comedy and tragedy wrapped up as one can be found only in reality itself. And “Tig” may very well be the best example of translating that concept to film. Rarely cheesy or emotionally manipulative, the documentary chronicles the series of unfortunate events in comedienne Tig Notaro’s life, all leading up to one of the most acclaimed comedy sets of all time. It’s unimaginable tragedy that results in similarly unimaginable comedy. It’s important to note that the description above is only representative of this film’s first half- and what a first half it is. Notaro is first diagnosed with a bacterial illness after collapsing on set. Only a week later however, her mother is killed in a tragic accident. It only takes a few more months however before the final tragedy hits: her diagnosis of stage 2 breast cancer. But “Tig” is not a movie about cruel nature of life, but rather how incredibly resilient a human being can be. 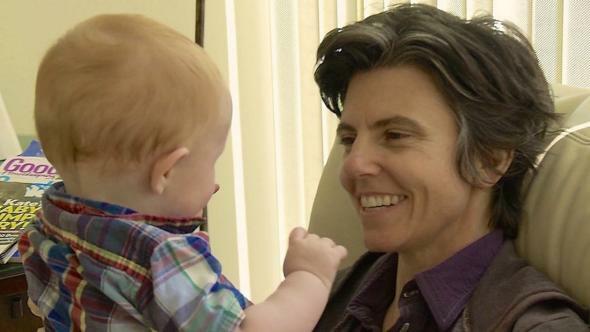 And resilient Tig Notaro is. Only a few days later, the comedienne steps out on stage and begins her set with the simple quote above. Her set continues into a collection of stories- funny and sad- that pushes the limits of how much humor can be found in the situations most would rather shove under the rug. It was a set that, as the film depicts exceptionally, had the crowd in tears and several other comedians in awe of her achievement. The film certainly has downtime however, and the second half is where most of it can be found. It would be unfair to not admit that the segments of Tig’s “crush” on a co-star of hers aren’t quite as exciting and engaging as those regarding her comedy or her cancer. This said, it takes reaching the end of this film to realize that there is a time and a place for the serious stuff, and for “Tig” to put the comedienne’s emotional and romantic life on display shows that she is just as human as the rest of us, despite being a superhero in every other way. But for how much the second half’s content exposes Notaro’s sensitive side, many of these segments are still undeniably pockets of stasis that could have flowed better. Regardless, “Tig” is an absolute must for those who love to see an individual get back on their feet when it seems most impossible. This entry was posted in Articles, REVIEWS and tagged cancer, comedy, documentary, Netflix, resilience, tig notaro, tragedy. Bookmark the permalink.